When you mention going to Croatia, everybody asks: are you going to Dubrovnik? The red tile roofs and white walls of the city are easily the most identifiable landmark in Croatia and its main tourist attraction. Separated from the rest of Croatia by a strip of Bosnia-Herzegovina, going to Dubrovnik often means skipping the rest of a beautiful gem of a country. While I would love to go back to Croatia and visit Dubrovnik, I'm perfectly fine with not visiting it the first time around. The red tile roofs and crystal clear blue Adriatic are to be found all along Croatia's Dalmatian coast. The second largest city in Croatia and the largest city in the Dalmatia region of Croatia, Split is a popular tourist destination especially for those seeking to explore Croatia's thousand-plus islands. 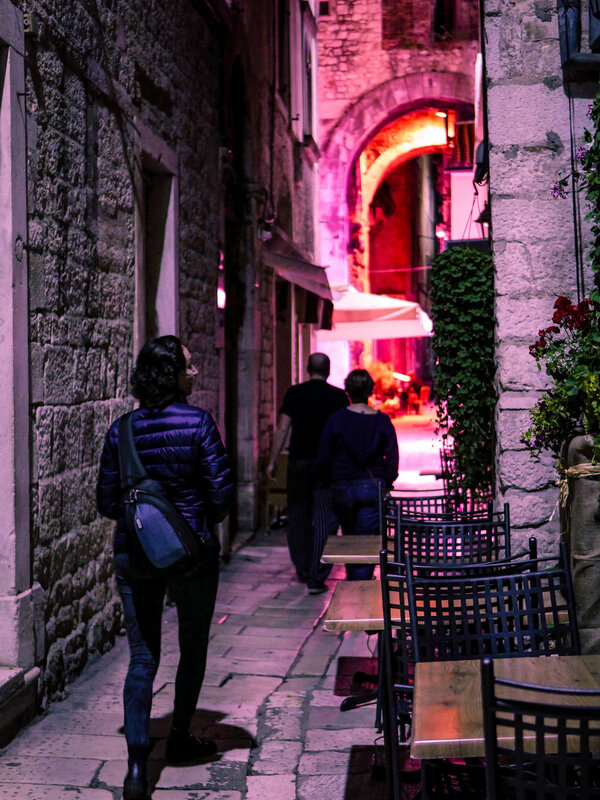 Home to Diocletian's palace, built in 305 CE as a summer residence for the emperor, Split is best experienced at night. At night, the city calms down from the overrun tourist frenzy but restaurants and bars remain open. The sun no longer beats down and you're not caught up in what will likely be the only traffic in Croatia: hundreds of cars catching ferries to Italy. It was in one of these traffic jams that we found ourselves caught in a scam. As we were driving around the winding narrow streets of Split's old town, a car honking and tailgating us for several blocks purposely rear ended us. We pulled into a parking spot and they pulled in next to us. Yelling with considerable profanity and some shoving occurred; they tried to get us to give them 200 Euro without giving us insurance information. Suffice to say, as soon as we called the police, they hightailed it out of there. Thankfully, Croatian police are friendly and the rental agency understood the accident was not our fault. If you're in Split during the day, enjoy walking through the palace and hang out with feral cats while eating gelato from Luka's. You can enjoy flavors such as forest fruit, wild strawberry, and chestnut. Right outside Split is the city of Solin, home to the ancient Roman ruins of Salona. Salona was the capital of the Roman province Dalmatia. Once home to over 40,000 inhabitants, Salona allows you to pretend to be a modern-day Indiana Jones, climbing over crumbled walls and steps. It's two-thousand-year-old gates, walls, crypts, and amphitheater deserve to be explored but when we were there only a few visitors joined us. 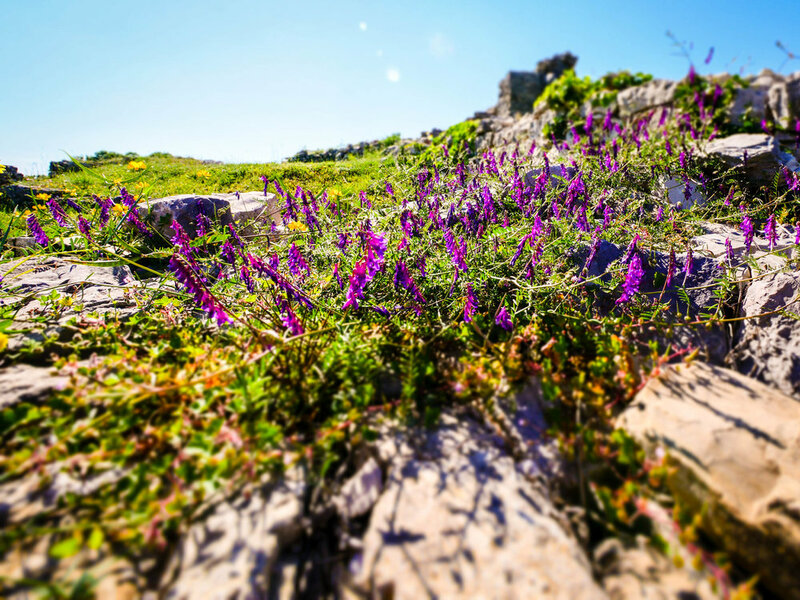 If you're in Split, then bring a picnic and enjoy sitting in the shadow of ruins surrounded by beautiful wildflowers. Known as the gateway to the Kornati Islands, Sibenik is home to the 15th-century Cathedral of St. James and St. Michael's Fortress. From the top of the fortress is an open air theater with stunning views of the bay and surrounding islands. 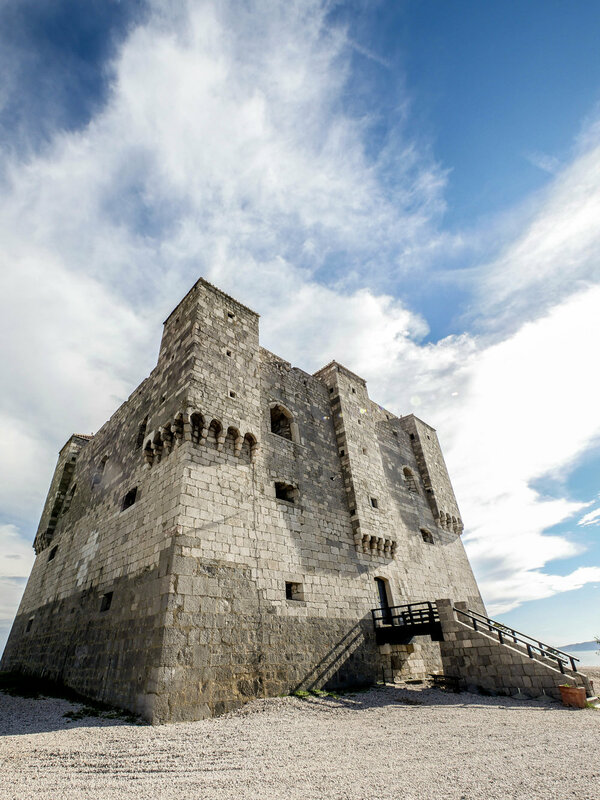 The fortress requires an entrance fee and the exhibits under the battlements are lackluster. We stayed at Villa Lavanda Deluxe, a set of apartments just 30 feet from the Adriatic. Our apartment included two bedrooms, a living room, a bathroom, a full kitchen and a balcony. The drive to these apartments takes you through olive groves, ancient rock walls, and fields of red poppies. At only 25 euros per person, it's an absolute steal that provides peace and quiet away from Split. If you're looking for excellent cuisine with an equally awesome wine list, Bokeria is a good choice for late night options in Split. Named after the famous market in Barcelona, Bokeria features dishes such as Chilean sea bass on cauliflower puree, goose liver creme brulee, and beef cheek risotto paired with local wines. For a truly special experience, make your way out to Roca Estate, a restaurant, farm, and vineyard featuring award-winning prosciutto and cured meats. To eat at Roca you need to make a reservation and order beforehand. We ordered the cold platter, roast meat platter, beef soup, and roast vegetables but selections change seasonally. The venison-pork sausage featured here is the best sausage I've ever eaten. Even if you're visiting Dubrovnik, don't let it be the only place on the Dalmatian coast you visit on a trip to Croatia.